WARREN, Minn. — Back home for her 55th class reunion, Janet Anderson visited the Marshall County Historical Society Museum. It’s a routine stop whenever she and husband Lyle return to their hometown from their residence in Sun Valley, Idaho. 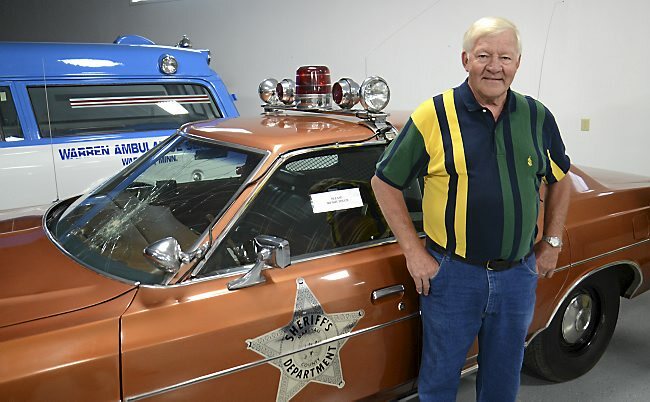 The top museum attraction for the Andersons — and many others — is a patrol car from what’s commonly known as the “Warren UFO Encounter” of 1979, the Grand Forks Herald reported. The Andersons aren’t alone. During county fair week each summer, museum visitors routinely number 5,000. “The car is the single item that most people mention as their reason for coming here,” said Kent Broten, the museum president. Dennis Brekke, the county sheriff in 1979 and now retired, regaled the Andersons and others about the incident, which involved Deputy Val Johnson, who is believed to now live somewhere in Wisconsin. Johnson appeared on “Good Morning America” soon after the incident, but quickly grew tired of interviews and attention about the episode. The patrol car left skid marks of 800 feet. Johnson suffered “welder-type” burns to his eyes from bright lights. The car’s two antennas bent, one at a 90-degree angle, one at 45 degrees. Both the patrol car’s clock and Johnson’s watch stopped for 14 minutes. Johnson remembered nothing during a 40-minute time period. The windshield was cracked, but the force of the damage didn’t seem to come from either outside or inside forces. County officials wanted the patrol car, a rust-colored 1977 LTD with only 60,000 miles on it, repaired and returned to the fleet. However, Brekke said, he persuaded them to leave it as it was for public consumption. “People like strange and unusual things they don’t understand,” Brekke said. The Warren UFO has resulted in two programs on the History Channel and another in 2012 on the Travel Channel, according to Herald archives. Paranormal researcher Chad Lewis is making the Warren episode part of his upcoming book on Minnesota UFO sightings and other phenomena such as crop circles and creatures such as Bigfoot. “Some people who come to my talks believe in this and some are skeptical yet still curious,” Lewis said. “Some are hoaxes, planes or satellites, but some are unexplained. I leave it up to the audience to make up their own minds. However, 82-year-old Ethel Thorlacius, who has worked at the museum for decades, has witnessed a trend.